The word luxury is one of the most hated and beloved of the national lexicon. It serves as a noun, adjective and even as a verb and is used both in the context of appreciation and depreciation of objects, people, luxury houses, places, ideologies, etc. As in Portugal we do not have the caste tradition we use a substitute that gives the name of "luxury" to segment people and tastes. The difficulty lies in measuring the limits of its application. What to some is luxurious, to others is banal. What for some is reproachable for others is cause for admiration and envy. This is a territory where consensus and common sense do not prevail and preconceived ideas prevail. What about luxury real estate ? How Much Does a Luxury Home Cost? The concept of luxury home does not have a very well defined price frontier. In Portugal it is usual to consider 500,000 Euros as the minimum price to catalog a luxury home, but in recent years, with the rise in prices in cities such as Lisbon, this minimum value is rapidly moving to the usual value in other richer European countries: 1 Million Euros . Of course this value is not consensual, a simple apartment T4, even without presenting characteristics usual for the luxury segment can reach 1 million euros in the city of Lisbon! As for the upper limit, the sky is the limit! If a house can reach values in the region of 200 Million, this limit is more difficult to ascertain because even in this segment secrecy and "prices under consultation" continue to keep some description in relation to this topic. Despite this, it is known that this year was sold in Lisbon - at Rua Castilho - a penthouse apartment, with three floors and an area of over 500 square meters, to a British investor for a total of 12.5 million euros ( 22 thousand euros / m²)! The price is undoubtedly an important factor to consider a house as luxurious, but beyond the price there are other features that motivate the buyer of this segment. In order of importance: the view, the location, the architecture of the property, the area of the house and land, security and privacy, the materials used in its construction, etc. Who buys a luxury home? In 2017, Portugal ranked 41st in the United Nations Human Development Index (HDI). It is therefore not surprising that the luxury real estate market has a lower demand than many countries for the "domestic buyer". However, in recent years the interest in luxury houses and developments has increased thanks to the economic recovery, but above all through demand and foreign investment . It is no coincidence that Portugal was ranked as the best country in Europe to live as an expatriate , according to the renowned survey of the Expat Insider . In world terms and in 2018, Portugal ranked 6th out of 68 countries . The reasons for this preference range from the climate, security, quality of life, cost of living and even the "warmth" with which the Portuguese receive visitors. In our country and in recent years we are talking about growth rates of 20% per year , only in the luxury segment. Not that the luxury market has been stuck during the years of the crisis that has shaken our country and the world, even because in times of crisis investment in luxury goods is always a haven for investors with capital, but tourism growth has put Portugal under the international spotlight and has contributed to accelerate this trend. This upward movement of the luxury segment began by gaining momentum with the Golden Visa ARIs and the Non-Habitual Tax Resident Scheme , but has attracted more and more wealthy are looking for Portugal to live and to work, from countries like China, Russia, USA, Brazil, France, Great Britain, Germany, Finland, Belgium, Switzerland, Angola, Turkey, India, United Arab Emirates , etc. etc. The fact that they have equity capital and their purchasing power is substantially higher than that of the Portuguese middle class, allows them to opt for houses with higher prices and characteristics associated with luxury real estate. And the Portuguese buyer? Well, since the lucky winner of Euromilhões (really! ), successful entrepreneurs, top executives of multinational companies, real estate owners who with the recent appreciation of real estate have made substantial gains, Portuguese expatriates who have returned to Portugal to invest, (they live in Portugal but work remotely from our country or use it as a transitory platform of rest while traveling around the world for business reasons), investors who see in this market an opportunity to appreciate their capital in alternative to classic financial investments, etc. etc. What are the favorite features of a luxury home? The Location - This is the most important filter for a luxury segment buyer. For this type of buyer, the greater purchasing power allows you to choose the best locations: places with river / sea views, near golf courses, unobscured views, luxury condominiums, charming villages, historical center of big cities, etc. Security - this is another priority: the condominiums that offer it are very popular and the demand is great especially by Brazilian buyers. Architecture - this is an equally appreciated feature. The properties designed by renowned architects are highly regarded and value the construction of a luxury property. Exclusivity - For the buyer of a luxury home, the price has to justify the difference. A property with unique architectural features, with ample environments and creative projects in the distribution of space and use of environments is more likely to be sold. Infrastructure - being able to enjoy leisure, services and security options are an added value valued by those looking for a luxury home. The luxury ventures that possess this type of characteristics are highly sought after. Technology - Home automation has been raiding the homes for some years and luxury homes are no exception. Nowadays, it is increasingly common to find real estate with automation systems where through a mobile phone it is possible to control almost everything. From remote surveillance through cameras, to remote control of lights, heating, biometric access, appliances connected through the Internet of Things, etc. These are some of the comforts that technology can offer to this type of buyer. Privacy - this is a usual requirement in the luxury segment. Some buyers look for real estate inserted in a quiet and quiet neighborhood, protected from the eyes of the mirones and the neighbors, and whose security is taken seriously: high walls, cameras with surveillance, etc. River / sea view , near golf, horse riding or beaches, contemporary architecture or with the charm of traditional Portuguese style, garden and outdoor pool, infinity pool, indoor garden, heated indoor pool, ecological features such as solar panels, garage or parking , large social spaces preferably in connection with the garden / pool, master suite with walk-in closet , underfloor heating, kitchen with quality materials , American kitchen, wine cellar, safe, gym or sauna , security, alarms and remote surveillance. New or renovated apartment with high quality materials, river / sea view or unobstructed view, duplex or triplex typologies preferably on the top floors (penthouse), landscaped terraces with pool / jacuzzi, modern architectural design with author decoration , concierge , porter or condominium , larger social areas to the detriment of utilitarian spaces (like the kitchen which is often replaced by a kitchenet), suites , garage / private parking, etc. What are the favorite places to buy a luxury home? Certain districts of Lisbon, the Cascais line and the Algarve have always been the privileged stage for the luxury segment, although cities like Porto and Braga and other cities have seen an increase in demand in recent years. In the city of Lisbon, the luxury segment prefers certain streets and neighborhoods such as Avenida da Liberdade and adjacent streets, Avenidas Novas , neighborhoods like Chiado, Príncipe Real, Bica and Sé, Lapa, Estrela, Campo de Ourique and Restelo , and more recent developments such as in Parque das Nações , Braço de Prata or Belém . On the outskirts of Lisbon the search for Luxury properties has a preference for Cascais (Guia and Quinta da Marinha), Estoril , Sintra (in the center of the village, Penha Longa and Várzea), Troia and Comporta . The proximity to the beaches and the sea, the charm of these villas and the existence of luxury condominiums of premium quality is a factor of attraction. 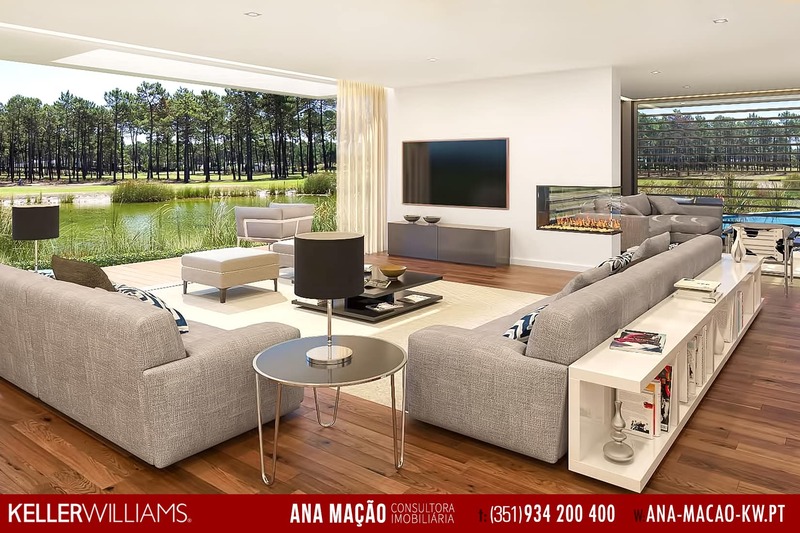 Golf courses are also a good anchor around which luxury ventures are born, such as the Oeiras Golf & Residence - where I sell the most houses and land for the construction of luxury villas - or the Belas Clube de Campo . In Porto, the preferred zones are Foz and in the vicinity of the City Park, the parishes of Lordelo do Ouro and Massarelos. On the other hand, the recent renovation of the city and its riverside areas along the Douro River are bringing new projects and new luxury developments aimed at the high segment. Braga is one of the cities in the country where prices have grown, after years of stagnation. Here, the luxury market has a special dynamic even by the multiplicity of farms and palatial houses that tourism has come to value. Areas such as the Sameiro and Bom Jesus slopes deserve special mention. The Algarve is the Algarve! The climate and the beaches are its main asset and the luxury real estate lives in its shadow. Places like the Golden Triangle (Vale do Lobo, Vale do Garro and Quinta do Lago), Albufeira (Olhos de Água, Baleeira and Galé), Quinta do Lago (Almancil) and Vilamoura (Loulé) are just some of the areas that place the Algarve at the top of international preferences, in terms of luxury investment in Portugal. But other cities such as Aveiro, Coimbra and Évora are creating new dynamics in the Luxury segment and will be able to give letters in the very near future. While in Lisbon the chosen typology is conditioned by the scarcity of the offer and the price of the land, the Luxury Apartment being the most frequent option, in the surroundings the House in a closed condominium, Quintas, the Palaces and Mansions represent an important range of this segment. What are the trends of luxury real estate for 2019? The relationship between the individual and the luxury object has been changing in recent years: for the younger buyer, rather than acquiring an object of personal promotion or ostentation the option is to acquire a home that mirrors their identity - who is what you care about and what your choices are - your taste, creativity, and ethical concepts. This change of focus is reflected in the need to personalize the space where you live. Millennials generation is now focused on "quality per square meter" and how the house fits into your lifestyle. This buyer is more attentive to the details of the house, prefers quality equipment and amenities like the latest technology. These features as well as the location of the property may even be more important than the size and areas of it. Although the generation of millennials is not the most representative of the high segment - the usual buyer of the high segment is between 38 and 65 years old - these will be the future buyers to condition the offer of luxury houses. With the construction going through a moment of strong recovery (the number of licenses issued has not stopped growing since 2017) it is expected that in 2019 the supply of luxury homes will grow and much, not only via renovation of degraded properties but also through new ventures. This is good for the high segment market since the new construction bets on more modern architectural lines and more recent quality materials. On the other hand there are new features (camouflaged garage with elevator for cars, heated indoor pools, outdoor camouflage pools, ecological and "smart home" features, underfloor heating, new combinations of materials, etc.) that are easier to implement when construction is done from scratch. A luxury home, for those who acquire it, is the realization of a dream, often the fruit of a lifetime of work. The increase in life expectancy leads to this type of owner more than 50 years, the house plays an increasingly important role, because in this age the relationship with time changes and allows you to enjoy it more and better . And as its purchasing power is greater the luxury market in Portugal has a path of growth ahead in this age segment. On the other hand, Portugal's exceptional living conditions (climate, cost of living, safety, etc. ), coupled with tourism growth, are expected to continue to attract the international buyer - Lisbon is investing in real estate in 2019 - and this looks for a more sophisticated and modern product and with luxury requirements. The buyer of luxury homes is more demanding and attentive to detail , supports their decisions with the support of technical audits of the property (especially when intending to buy a used house), has particular legal support and privileges business partners with proven and experience in this type of segment. This is a challenge for the partners involved in this segment of the real estate: promoters, builders, architects, decorators and real estate agents will have to adapt and improve their skills to successfully address this segment of the market , which may represent a substantial business for the next few years. PS: My thanks to João Rodolfo ee for the company: Traçado Regulador, Lda for the kindly photographed photos.